This past February Mr. Elementaryhistoryteacher and I ran off for a quick weekend in Charleston. It was rainy and cold most of the time, so we didn't get a chance to walk around very much, but we did take a turn through the visitor's center and then headed across the street to The Charleston Museum. The museum was founded in 1773 and is commonly referred to as America's first museum. While I found all of the exhibits informative and well done, one of the smaller ones simply astonished me. I love learning new things, and these types of cemetery markers were TOTALLY new to me. Yes, that's a four poster bed headboard and for some people in the 18th century this served as their grave marker. I came home from Charleston and began digging a little deeper. I found an article from The Milwaukee Journal dated June 17, 1927 titled, "Four Poster Bed Headboard Marks Grave 189 Years". From the article: Still intact after serving 189 years [in Charleston, South Carolina] as a tombstone in St. Michael's Cemetery here a four poster headboard of an old wooden bed has been uncovered by a cleanup crew working in a cemetery. The unusual marker was part of the bed used by Mary Ann Luyten during her lifetime. Some years before her death she decided that its enduring tidewater cypress wood should make a particularly satisfying tombstone. In writing her will she directed that this be done and ordered the inscription which was to be carved on the bed. The words were plainly visible when workmen removed leaves and moss which had partially covered Mrs. Luyten's grave marker. 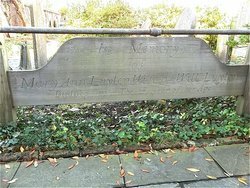 They read, "Mary Ann Luyten, wife of William Luyten Died September 9, 1770 in the twenty seventh year of her age"
Apparently, this practice was repeated by others. 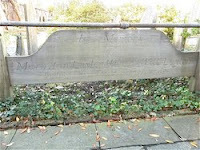 In a more recent newspaper article from April, 1982 published in The News and Courier advised that for years the St. Michael's grave rails such as Luyten's were thought to be the only ones remaining in North America, but now there is a third "bedstead" shaped wooden grave rail that has been stashed away at St. James Santee Episcopal church for many years...It resembled the headboard of a bed and was designed to be set in the ground over the grave. I find the markers to be very interesting....a whole new spin on "Now I lay me down to sleep." Wow! I learned something new today. Your post was interesting. I had no idea bed headboards were actually used before as grave markers. They are really interesting and it applies to the saying, now i lay me down to sleep. But i wonder, why bed headboards? Anyway, this has been informative. Great post! Little, seemingly insignificant things like this help define a community and its history. Finding a competently maintained local museum is like finding a gemstone in a rock pile. That looks like a fabulous trip. I'm hoping to someday get over that way. I was interested in knowing if/how things you find in your own life or on trips like this can be used in the classroom? I am currently a student in college going for elementary education. While I will be teaching all content areas, social studies is my favorite. I really liked your post about your experience at the museum. I think you provided valid information and allowed your viewers to see into a part of history I had no idea about. I have been to SC before, but never to this area. The pictures alone make me want to visit this area and see this museum. I hope you continue to post educational information and inspire people like me to get out there an experience things so that we can come back to our classrooms and teach. I live in the Charleston area and I've never thought much of this as practice. We have many churches and therefore many, many gravestones. Next time you come to towm go visit some of the plantations on hwy 61 and make sure to go see Charlestown Landing in West Ashley. In the summer they have all kinds of neat stuff to educate people. It is where the town started, the fist town was right off the Ashley River. I hope that you got to see The Battery with the cannons and hear about the history there. I have been here so long I could probably be a tour guide myself. :) Oh, and another thing, Fort Sumter is always a good place to get some history. 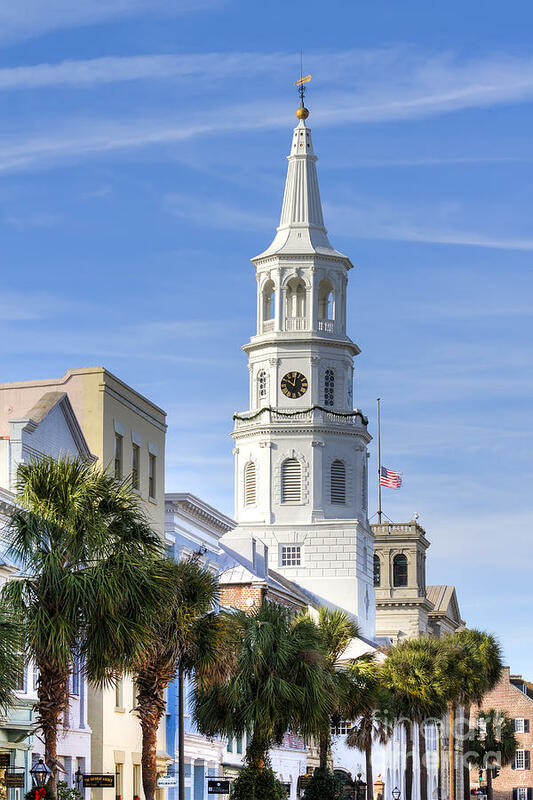 Walking down the street in Charleston is an event in history. You just have to know where to look. Glad you enjoyed our city. I think that history can be made interesting if taught more like practically. If students are taken to museum and explain by showing the details there. How interesting that people used their headboards as grave markers. I know some of those four post beds have been handed down through generations. I now wonder if some of the beds were a bit incomplete and maybe certain parts of the bed are older than others.